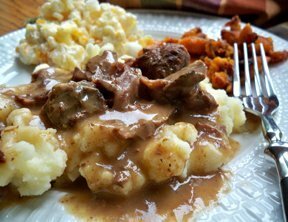 This slow cooked beef recipe makes tasty gravy that is delicious over mashed potatoes or noodles. After being slow cooked the meat falls off the bones and is full of flavor. Your family will love this warm hearty meal. See how to check the cooking temperature of your slow cooker to ensure proper cooking. Follow these guidelines on adapting your favorite traditional recipes to be cooked in a slow cooker.